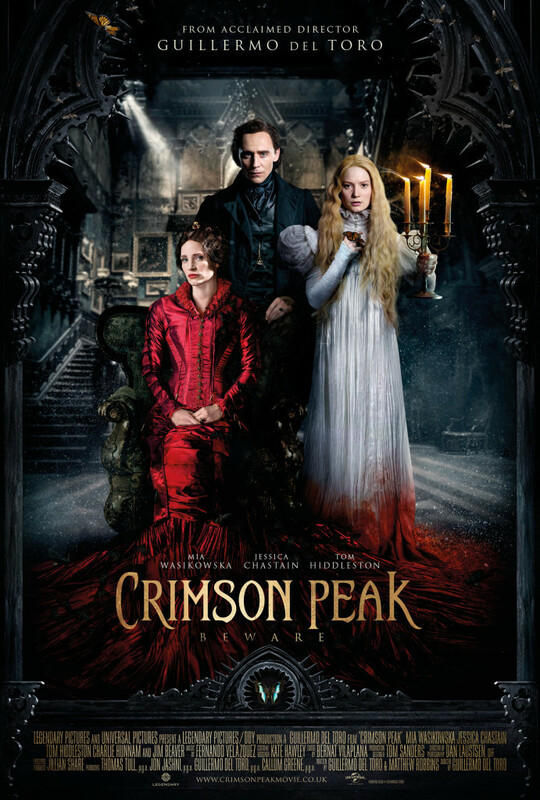 Yesterday I saw the movie Crimson Peak with a group of friends. I thought I might review it for a bit of a change from book reviews, especially because I loved it so much and find it so interesting to discuss! All I knew going into the theatre was that it was about a girl who falls in love with Tom Hiddleston and sees ghosts. I had seen the trailer maybe once or twice completely, but I am a big fan of Guillermo del Toro as a director, so I knew I would probably like it no matter what. He always has the most unique vision in his films, and executes them so well. I had assumed this would be a scary movie about a girl who sees ghosts nobody else can, and that she might be terrorized by them and the plot would be about the girl fighting for her life. I was pretty wrong, and realized that about twenty minutes into the movie. Something I had initially taken for granted was the story of this film itself. Del Toro pulls out all the stops and tells such a complete, beautiful, eerie story. The cast could not have been more perfect. Mia Wasikowska is one of my favorite actresses and played the part of Edith, the aspiring author. Tom Hiddleston plays the part of Thomas Sharpe, orphaned son of an English baron. I was never one to really faun over Hiddleston before, but oh my goodness, did this movie change that. He was one handsome gentleman in this movie. *swoon* Jessica Chastain as Lucille Sharpe, Thomas’s sister, absolutely blew me away. Her performance was incredible, her character’s slow unraveling so subtle yet so chilling. Other actors who make appearances are Charlie Hunnam from Sons of Anarchy and Pacific Rim, Jim Beaver from Supernatural, and my favorite (and possibly the most famous) character actor, Doug Jones. Doug played the ghosts in this film, and has been known for his roles in films like Hocus Pocus, Pan’s Labyrinth and Hellboy. The Movie’s summary, according to IMDb is “In the aftermath of a family tragedy, an aspiring author is torn between love for her childhood friend and the temptation of a mysterious outsider. Trying to escape the ghosts of her past, she is swept away to a house that breathes, bleeds - and remembers.” I didn’t really like how it was pitched as a love triangle, because it was evident who Edith had romantic feelings for. Edith lives in Buffalo, New York with her widower father. 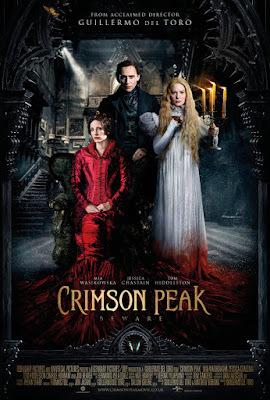 Her mother died when she was ten, and one night her mother's ghost visited her in her sleep with a terrible warning: "When the time comes, beware the Crimson Peak." She appears as this wispy black-shrouded skeletal ghost, and she isn't threatening or menacing, just...... Urgent. And, okay, she’s also entirely creepy and a little terrifying. Years later, Edith is a writer trying to get published. The editor who first reads her book claims he's surprised that she would choose to write a ghost story; to which she replies, "It’s not so much a ghost story, rather, it's just a story with ghosts in it" -- essentially, though she doesn't know it yet, that is Edith's story, this statement reflects on the rest of the movie. Right around this time a mysterious stranger appears in town: dark and handsome, the son of a long dead and once wealthy English baron, with his beautiful sister in tow. Thomas had come to America seeking sponsorship for his newest invention. Thomas's family estate was built atop a mound of clay so rich in iron, it turns bright red as a result of the oxidized mineral. This offers an opportunity for hidden wealth in the manufacturing of bricks from the iron-rich clay. Thomas is desperate to provide for himself and his sister, but no one will invest in his clay harvesting machine. Though futile in his endeavors financially, Thomas falls in love with Edith, whom he weds and brings back home to Allendale Hall in England as she soon finds herself coming into her inheritance. Allendale Hall is this once beautiful but now decrepit and decaying manor, isolated from the nearest town. It's a gorgeous old Victorian manor with a giant hole in the main hallway ceiling, it oozes red clay as it sinks further into the eroding ground, and it is rife with ghost activity. They seem sinister at first, but you realize they're all really just trying to help Edith somehow. We soon find out that Thomas and his sister aren't exactly what they seemed, the house is hiding more than crumbling paint and oozing clay. A major plot twist toward the end of the film will surely shock you, and Lucille’s slow descent into utter madness is so subtle, so intricately portrayed that when we see her lose all of her composure, the result is truly terrifying. All in all, this movie was visually stunning and an incredibly well-written story with the talented actors to match. Suspenseful, romantic, and full of edge-of-your-seat creepiness, this movie far exceeded my expectations. I can't say enough how gorgeous this film is from a cinematic and visual standpoint, Guillermo del Toro never fails to awe and amaze with his visuals. My friends and I spent hours talking about the plot long after leaving the theater. There were only one or two very minor plot holes that bothered us, but we all agreed they weren’t that important in the end – things like why Edith’s wedding ring was such a big deal, or what the full story of Thomas and Lucille’s parents was, or if Edith ever got published in the end. I wouldn’t so much as call this movie a horror movie, but a Victorian thriller. The ending was very well done and more than a little bit heartbreaking. I could keep talking about this movie in-depth, analyzing each scene and the character development, but I really don’t want to give away more than I already have. I can’t wait to go and see it again and pick up on details I might have missed the first time! If you’ve also seen this movie, please let me know what you thought in the comments! I’d love to discuss more aspects of the plot with you!